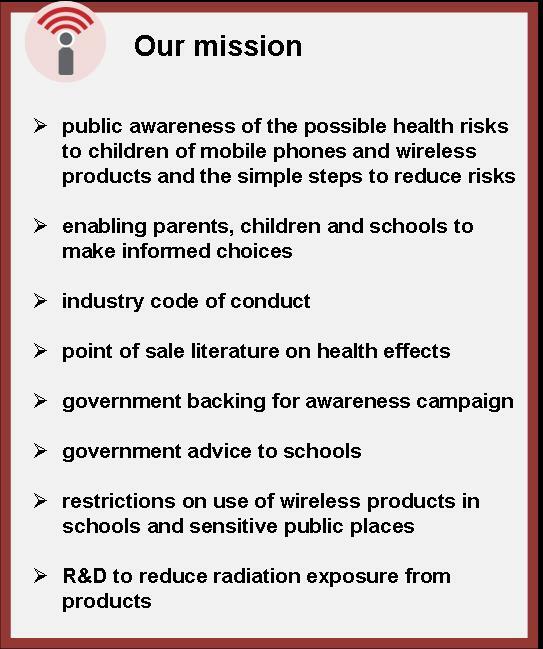 WiredChild is an initiative run by a group of concerned parents, raising awareness of the potential risks to children of exposure to radiation from mobile phones and other wireless technology. We hope to enable other parents, schools and children achieve a better balance between safety and convenience. We want to increase awareness of the extent of the evidence of serious risk, and the simple ways to reduce those risks. We hope to head off a potential increase in cancers and other serious illnesses amongst the generation of children growing up today. WiredChild is entirely staffed by volunteers, fitting in this work around our families and work commitments. Amongst our group we have a scientist, a teacher, a lawyer, an accountant, a film maker and a marketing consultant and we are advised by a panel of expert scientist patrons. Cindy Sage: Full Member, Bioelectromagnetics Society; Sage Associates, Santa Barbara, CA USA. Co-Author BioInitiative Report. We have no axe to grind, no vested interests. We feel we are lucky to have stumbled upon the evidence of potential harm and that we have a duty to inform others so they can make choices to protect their children's health as we are doing. The UK Chief Medical Officers recommend that as a precaution children should not use mobile phones for long or inessential calls. The government doesn't appear to have taken steps to spread that message so WiredChild is trying to fill the gap. We are going further and informing the public of the possible risks to children's health of the now ubiquitous wireless technology, whose long term effects are untested and which emits the same kind of radiation as mobile phones. The financial interests at stake in the mobile telecommunications industry are huge and the corporates dwarf us in the resources they have available for publicity and "spin". Many of the institutions who have a role in protecting health temper their advice because of an overriding concern not to cause panic or economic damage. We believe this prevents them fulfilling their alarm-raising function and that it falls to volunteers to meet this need. Every statement made in this website is supported by evidence. Some people take a different view of that evidence but we think ours is a reasonable one and we are happy to be challenged on it. Because we have no vested interests and only the protection of children at heart, we think parents will be interested in our perspective.